As a kid in the early to mid-1970s I remember boxes and all sorts of products lined up my Grandmother’s kitchen. Cleaners, soaps, shampoos and fragrance bottles were being packed in bags and boxes, ready for delivery. 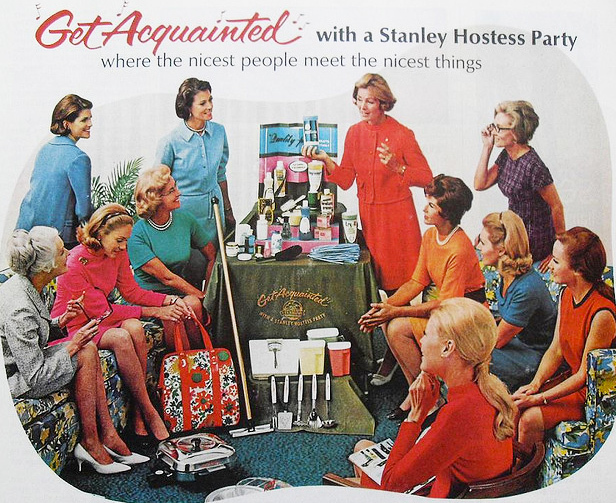 She was a Stanley Home Products representative. SHP was founded in in Westfield, Massachusetts in 1931 by Frank Stanley Beveridge (vice president of sales for The Fuller Brush Company) and his associate, Catherine L. O’Brien. The goal was to influence people facing economic hardship due to the Great Depression to start their own business. People would put up a small investment and would then sell products people use every day. Initially a door-to-door selling company, SHP offered household cleaners and cleaning tools. In the late ’30s an SHP dealer started giving product demonstrations to clubs in order to boost sales volume. Fellow dealers were excited about this unique method and took it a step further by creating what is called the “party plan”. Homemakers would invite their friends for demonstrations. 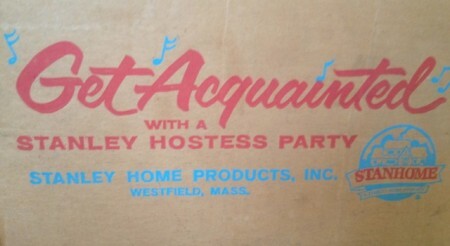 The hostess would provide light refreshments and would receive a gift for hosting the party. The party plan quickly became popular and is the primary method the company uses today. Interestingly, many of SHP’s early representatives went on to create their own enterprises. Mary Kay Ash, founder of Mary Kay Cosmetics, received early training through SHP, and Brownie Wise moved on to Tupperware. Wise focused exclusively on the party plan concept and soon the method was outselling all of Tupperware’s store sales. Over the years, SHP launched and expired various product lines. When I was a kid the company introduced the That’s My Girl line, which featured brushes, combs, shampoo and other “beauty” items. They also used to sell costume jewelry, kitchen gadgets and utensils and various knickknacks. Today, SHP sells mostly fragrances, home cleaning solutions and vitamins. Many lines from decades ago were discontinued. You can shop them online here. Do you remember the SHP of the ’50s to the ’70s? Have an old catalog? We’d love to see some more history from this retro company.